MANHATTAN, Kan. — Although only 9 percent of reported foodborne illness outbreaks occur in the home, scientists estimate the actual number of incidents is much higher. Research shows a leading cause of cross contamination within the home is actually an object associated with cleaning, the kitchen towel. A study recently published in the journal Food Protection Trends showcases the work of several Kansas State University faculty and students. Lead researcher and K-State food safety specialist Jeannie Sneed said the study showed some unique observations and areas of weakness when it comes to consumers’ kitchen behavior. Video observation showed many participants would touch the towel before washing their hands or used the towel after washing their hands inadequately. Even after properly washing their hands, they would reuse the infected towel and contaminate themselves all over again. Researchers believe this could be one of the most critical findings of the study, because cloth towels can quickly and easily become contaminated at significant levels, including microorganisms that potentially can lead to foodborne illnesses. Other researchers found that salmonella, bacteria commonly found in raw meat and poultry products, grows on cloths stored overnight, even after they were washed and rinsed in the sink. This is why Sneed recommends washing cloth towels after using them while preparing a meal, or using paper towels and discarding them after each use. The second observation from the study was cell phone handling during the food preparation process and the lack of proper sanitation afterward. While electronic devices are becoming useful tools for communication, entertainment and a method of gathering recipes, they add another potentially important source of contamination. If such devices are going to be used in the kitchen, Sneed recommends treating them as potential hazards and wiping the surfaces with a disinfectant solution frequently. The U.S. Department of Agriculture (USDA) hopes to conduct further research on the use of cell phones and tablets in the kitchen. The USDA Food Safety and Inspection Service funded the K-State study “Consumer Food Handling Practices Lead to Cross Contamination” in an effort to better understand the behavior of consumers with young children and observe the effects of food safety messages. The 123 participants of the study were randomly assigned to three separate groups. The first group was given an education program on the four national Food Safe Families campaign messages of clean, separate, cook and chill. The second group viewed and discussed the Ad Council public service announcements that focused on the same Food Safe Families messages, and the third group did not receive any food safety education before preparing the meal. The researchers set up a condominium on the K-State campus to reflect a home kitchen environment and videotaped the participants preparing a recipe using either raw ground beef or chicken and a ready-to-eat fruit salad. The raw meat was inoculated with Lactobacillus casei, a nonpathogenic organism commonly found in yogurt but not naturally present in meat. The L. casei served as a tracer organism that allowed Randall Phebus, K-State food microbiologist and co-author of the study, to track the levels of meat-associated contamination spread throughout the kitchen while preparing these meals. Phebus and his team of students found that more than 90 percent of the fruit salads prepared alongside of the meat dish were contaminated with the tracer organism, suggesting that if the tracer represented a pathogen such as Salmonella, a high risk of foodborne illness was generated during the meal preparation. The study found that all participants, regardless of food safety message group prior to the meal preparation, made mistakes in the kitchen that could lead to foodborne illness. In addition to the high levels of contamination in their cloth towels, about 82 percent of participants also left meat-originating contamination on the handles of the sink, refrigerator, oven and trash drawer. While the study paints a picture of the objects consumers often leave contaminated, it is also important to note common improper behaviors that occur in the kitchen, which are often difficult to change. For more information about food safety practices and what consumers can do to prevent cross-contamination visit the local extension office, go online to K-State Research and Extension or visit FoodSafety.gov. Sidebar: Tips and Tricks for a Safe KitchenKansas State University food safety specialists Jeannie Sneed and Randall Phebus will both admit that even with extensive education and experience in food safety, neither is perfect in the kitchen. With families of their own, they understand how hard it can be to prevent cross contamination in the home and have provided tips they use in their own kitchens.1. Wash your hands; don’t just splash and dash.Sneed believes the most important habit consumers should add to their routine is proper and frequent hand washing, which is often not up to par. The Academy of Nutrition and Dietetics estimates proper hand washing may eliminate nearly half of all cases of foodborne illness and significantly reduce the spread of the common cold and flu. Follow these recommended steps for proper hand washing: use warm water to wet hands, scrub with soap and water for 20 seconds, rinse well with warm water, and air dry or use single-use towels to dry hands. 2. Wash your cloth towels. A K-State study identified cloth towels as the most common contaminated surface, and a major reason was simply how often they were handled. Sneed recommends refraining from using the same cloth towel for every task in the kitchen. Instead, use a paper towel for drying hands or to wipe something off the counter. 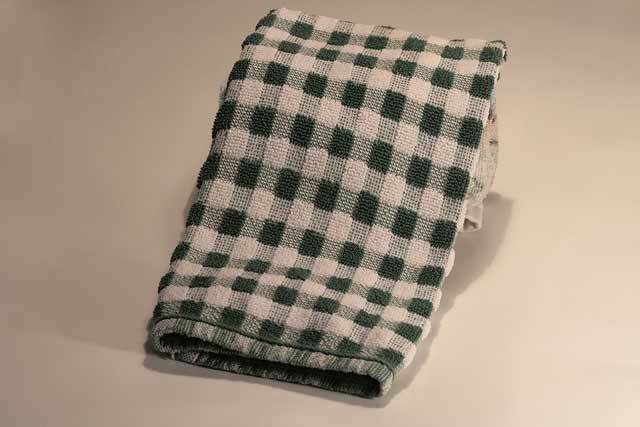 Cloth towels also should be washed frequently; Sneed prefers consumers change out their towels every day or even after every meal prepared with raw meat and poultry. 3. Don’t use sponges, but if you must, use proper sanitizing methods. The USDA does not recommend using sponges in the kitchen, but Phebus knows that most consumers use them despite that recommendation. Consumers who can’t part with their dish sponge should frequently sanitize it to kill and prevent the spread of pathogens that use a sponge’s humid environment to thrive. Sanitation can be done in multiple ways, such as putting the sponge in the dishwasher or soaking it in a weak bleach solution. Phebus prefers placing the damp sponge in his microwave and zapping it for 30 seconds. 4. Use a food thermometer. Most foodborne pathogens die when a food is cooked properly, which is why some ready-to-eat foods such as salads pose such a high risk for making people sick. The only way to know food has been cooked well enough to destroy any potential microorganisms is to go by temperature. Cook ground beef to 160 degrees F and poultry to 165 degrees F.
5. Separate duties of commonly used items. The spread of foodborne pathogens centers on contact with contaminated sources. As food is stored and prepared, separate ready-to-eat foods, such as fresh fruits and vegetables, from raw meat and poultry. This includes separating tools or surfaces used in preparation, including items such as dish towels, cutting boards and other contact surfaces. Sneed likes to separate her cutting boards by color by assigning a different color to those used with raw meats and those used with fresh fruits and vegetables. She also separates her cloth towels by usage, one for hand washing and the other for drying dishes. 6. Think like a microbiologist; sanitization is your new best friend. Sanitation is the best defense for stopping the spread of contamination, but with busy lives it can be difficult to find time to properly sanitize a kitchen. Phebus recommends building sanitation into the daily kitchen routine. Research found that regardless of the message or communication style, it all comes down to consumer behavior and the willingness to change old habits or take a little extra time to sanitize another surface. For more information about food safety practices and what consumers can do to prevent cross-contamination visit your local extension office or go online to K-State Extension Food Safety. Other websites, FoodSafety.gov and Fight Bac, provide more information as well.